"Let's vote." Republican senators—including some who initially called for a delay—say Kavanaugh's nomination should go to a vote if Ford doesn't testify, the Hill reports. "Republicans extended a hand in good faith. If we don’t hear from both sides on Monday, let’s vote," says Sen. Bob Corker. Calls for a delay. Ford, who accuses Kavanaugh of sexually assaulting her when he was a 17-year-old Georgetown Prep student, hasn't confirmed whether she will be at the hearing if it goes ahead Monday, the Washington Post reports. Democratic Sen. Dianne Feinstein called for a delay, saying the "rushed process" is "unfair" and is reminiscent of the treatment of Anita Hill in 1991. Republicans have said only Ford and Kavanaugh will be allowed to testify. Life upended. In a letter to the Senate Judiciary Committee, Ford's lawyer said she has had to move after receiving death threats. Her home address was posted online by white nationalists and she erased her social media presence amid heavy criticism from conservatives. Friends say the last few days have confirmed Ford's fears about going public, the Washington Post reports. "She’s spending her time trying to figure out the logistics of her life as it is now and how to keep herself and her family safe," one associate says. "What happens at Georgetown Prep." The accusations have drawn fresh attention to a Kavanaugh speech in which he recounted tales of heavy drinking while at Yale Law School, the New York Times reports. In an excerpt from another speech, tweeted by Sen. Elizabeth Warren, he mentioned his high school days. "What happens at Georgetown Prep, stays at Georgetown Prep," he said, adding: "That's been a good thing for all of us." "No memory." Mike Judge, the friend of Kavanaugh's who Ford says was in the room during the alleged assault, said in a statement that he has "no memory of this alleged incident." 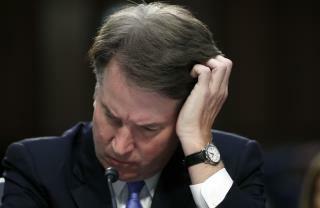 He said he can't remember the party, and "more to the point, I never saw Brett act in the manner Dr. Ford describes." CNN reports that Judge wrote about heavy drinking at Georgetown Prep in his book Wasted: Tales of a Gen X Drunk, in which he mentions a "Bart O'Kavanaugh" throwing up in somebody's car. "Democrats Playbook." The AP reports that President Trump, who has expressed sympathy for Kavanaugh, has already rejected having the FBI reopen its background check of the nominee. "The Supreme Court is one of the main reasons I got elected President. I hope Republican Voters, and others, are watching, and studying, the Democrats Playbook," he tweeted Tuesday night. Grassley, gassey, a$$y is an idiot.